Many types of kanji standing for divinely natural products such as mountain and river are very often used as part of shikona. One of the reasons is that sumo is originated from ancient Shinto rituals for praying for richer crops and local prosperity. Sumo event was held in front of a local Shrine in many parts of Japan, since this martial art was considered to purify the land and express a great respect to the nature and God. Another reason is that many professional rikishi come originally from rural areas in Japan. Each of them shall not forget his hometown and will try very hard to be a great rikishi who will surely become the pride of his hometown because his shikona is named after the divinely natural products representing the hometown. Among kanji for divinely natural products, “山” (mountain) is most commonly used as part of shikona. Mountain represents something big and mighty just like rikishi. Their home mountains have something precious for rikishi from rural areas in Japan. Sumo originated from Shinto rituals for praying for richer crops in ancient times. From this viewpoint, mountain is a symbol of the blessings of hunted games and harvested pickings. “川” (river) is another representative kanji standing for divinely natural products as well as mountain. Many farmers in Japan traditionally produce rice, and so rivers are their precious water supply source for rice fields. River means something grand and something close to our life. For example, many Japanese used to play in small rivers in the childhood. Japan is a sea-surrounded country, and so it is logical for rikishi to have sea-related kanji as part of their shikona. Of all type of sea-related kanji, this kanji “海” is the representative one because it means the sea itself. The kanji gives us the feeling of something grand and wild. 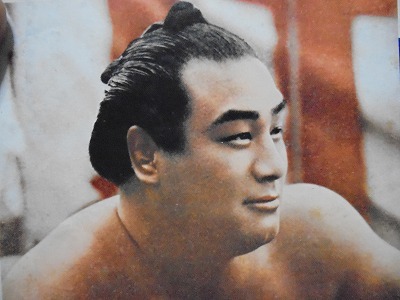 Many famous rikishi actually come from seacoast areas and went fishing in the sea to help their family business and then naturally strengthened their lower limbs in their boyhood. As you know, Japan is composed of many islands. This kanji is often used as part of shikona for rikishi who come originally from seacoast areas as well as “海” (sea). Rikishi using “山” (mountain) as part of their shikona often have a big physique and strong power, while those using “島” (island) are rather small in physique but excellent in wrestling techniques.